An article written by Professor Wang Min and published in the Japan New-generation Overseas Chinese Newspaper last Wednesday sheds light on how Japanese Emperor Akihito and Empress Michiko view the relationship between Japanese and Chinese cultures. Every year, Japan's Emperor and Empress invite experts and scholars for talks and discussions at their palace. On February 26, 2007, I was recommended and invited to take part in a special lecture themed on "mutual understanding of the Asian culture", where I was able to communicate with the Emperor and Empress face to face. In accordance with the standards of many countries, the content of the closed-door discussions has to be kept in secret for a certain period. Two years later, we can now talk about it. We talked with the Emperor and Empress while we dined together around a small table. Though the Empress had a cold and a fever, she showed considerable interest, sustaining the discussion with her guests and prolonging it beyond the scheduled time limit. Aware that I was Chinese, Emperor Akihito began by mentioning that his second son had studied Chinese at college and had once been to southwest China's Yunnan Province to learn about ‘the rooster of the long-crow' as part of his thesis. It is said that in Ancient Japan roosters were raised in order to listen to their crow and admire their beautiful feathers rather than for eating. Empress Michiko recalled that when she was a little girl, her textbooks contained many Chinese poems and articles. Thinking back to a song recounting how large China is and how broad the Chinese mind is, she was even able to recite all the lyrics by heart. She also said that plum blossom was described in detail in the famous Japanese literature works Manyoshu, reflecting the influence of Chinese culture. Japanese people began to depict cherry blossom after the 10th Century AD, but previous to that era, the flower that was most talked about was the plum blossom. 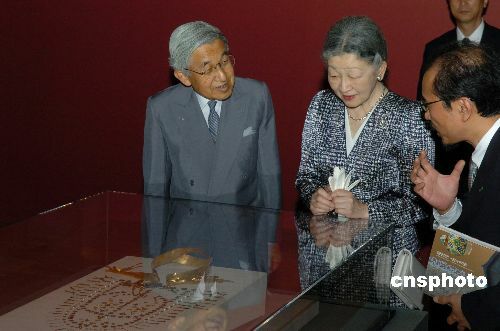 Emperor Akihito went on to explain that many Japanese royal family rituals were related to Chinese traditions. For instance, in the past the Empress needed to wear the "phoenix coronet and decorated shawl" when attending a ceremony, just as a Chinese Empress would do. He also said his alternative courtesy name - "Rong", meaning tung – also had Chinese connections, as Japan had a similar legend telling how the phoenix will fly to the tung tree, which is a sign of luck and prosperity. Both the Emperor and Empress said they had been to China's Shanghai, Beijing and Xi'an cities and loved their trips there. I talked about the century-old tradition of Chinese students studying in Japan. They listened carefully and appeared very familiar with China's history. On the subject of studying and living in Japan, I said that my experience was that many Japanese people enjoyed Chinese poetry and ancient Chinese culture. Japan's Shoso-in, where the national treasures are kept, houses many valuables such as ancient traditional Chinese musical instruments like the lute. Many wars and natural disasters have taken their toll of such items, and few have survived. Some ancient Chinese books that are now out of print in China can still be found in Japan. The Empress said Japanese people knew less about China than previously, though many still pursued such studies. Lots of Japanese were indeed interested in China, although fewer knew a few about the South Korean culture. I asked whether they had seen the South Korean TV series Dae Jang-geum. They smiled and said both they and their granddaughters enjoyed it very much. When I told them that its audience rating in China is 20 percent, the Emperor immediately asked why. I explained that although people saw things differently, by watching this TV series they could see how traditional culture penetrated deeply into their daily lives, and feel the impact of such traditions. When the Emperor and Empress asked how modern Chinese viewed Japanese culture, I told them Chinese people had a good many opportunities to acquaint themselves with Japanese culture. From the most ancient books - Kojiki and Manyoshu - through those written in the Taisho Period and Showa Period, to contemporary novels by Haruki Murakami, large numbers of typical works had been translated into Chinese and were available in most book stores. Some people consider that Japan is the storehouse of the Asian cultures as it has preserved cultures that have disappeared in other Asian countries. I think there was some truth in this. I had not been familiar with the rituals of the Double Seventh Festival, but in Japan I learned what were the appropriate ornaments, food, and ceremonials. Talking of the Japanese books I have translated, I told them the Chinese version of Kenji Miyazawa, a poet and author of children's literature of the early Showa period, would be published in China soon, which seemed to please them. When the Emperor asked my opinion on Miyazawa's works I referred to the poem Not Losing to the Rain. This poem helped me to appreciate that whether Japanese or Chinese, we are all the same - simple people who love peace and enjoy life. Prior to this, I had known a different kind of Japanese, in particular members of the military, and this poem offered me the chance to discover another Japan. The Emperor repeated the phrase over and over: "Yes, we are the same."